And they spend days, weeks and months jumping from one traffic source, one new shiny tool to another, thinking: “this is it!”. But it never is it. Are you one of them? And do you know why you aren’t getting the results you’re hoping for? More traffic means more sales, that part is true and you can’t get around it. But you won’t get there by trying out the new things as they come out. You don’t need new traffic sources. You have to be more productive about those that you already have. There’s no magic formula that can guarantee tons of visitors, and targeted visitors, to every single website and every single business model imaginable. 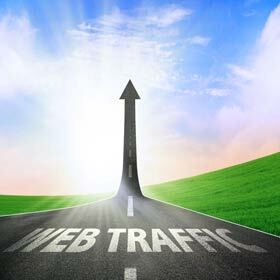 There is however one simple truth that can change the way your Internet business is going: if you want more traffic, you have to carry out more actions that will actually increase the traffic you’re already getting. But the trick is, you probably have no clue which actions are the ones that are bringing traffic to your website, and what kind of traffic you’re getting from them. You don’t have a real traffic system in place. And you probably aren’t consistent in using the tools, trick and tips that you’ve gathered. That’s how it is with most people: one day they try guest posting, the next – video or article submission, then forum commenting… It can’t work that way, it never could. You probably don’t have the resources to do the real split testing, but this little exercise can provide you with close enough results. Pick four of the traffic generation techniques that you enjoy the most. Let’s say guest posting, article submission, forum commenting and video submission. Now go buy a calendar. You will be doing each of them effectively for one month, but you have to document your work. Let’s say that the first month will be dedicated to guest posting (you can do others as well, but now you’re tracking just this one, and you will probably do it more than the others simply because of the fact that you’re tracking it). For each day you perform a real action related to guest posting – searching for blogs, sending outreach emails, writing (or ordering) the articles – mark each of these days in the calendar. But only when you’re actually doing something. Don’t touch the calendar if you’re only reading about guest blogging (you already know all that stuff anyway). Do the same for each technique, month after month. You will be able to look at your analytics and see which ones have brought the most traffic and sales. This isn’t the most precise way of telling how well a technique is performing (guest posting, for example, will show results later than forum posting, but you can analyze the traffic by the websites that referred it) – but you’ll get a better picture of what actually works for you and your website than you have now.